The epic journey continues for Moana fans as Walt Disney Animation Studios introduces an all-new sing-along version of the hit, critically-lauded comedy-adventure Moana, coming to theaters nationwide Jan. 27, 2017. Additionally, the original theatrical version of the film will release digitally Feb. 21 and on Blu-ray March 7. Fans are invited to warm up those vocal cords and set sail with an all-new sing-along version of Moana launching in more than 2,000 theaters nationwide on January 27 and exclusively at Hollywood's El Capitan Theatre on January 20. Moana audiences were swept away by the film's original songs and score from a dynamic team that includes Tony, Emmy and Grammy-winning songwriter Lin-Manuel Miranda (Pulitzer Prize- and Tony-winning Hamilton, Tony-winning In the Heights), Mark Mancina (Tarzan, Broadway's The Lion King) and Opetaia Foa'i (founder and lead singer of the award-winning world music band Te Vaka). 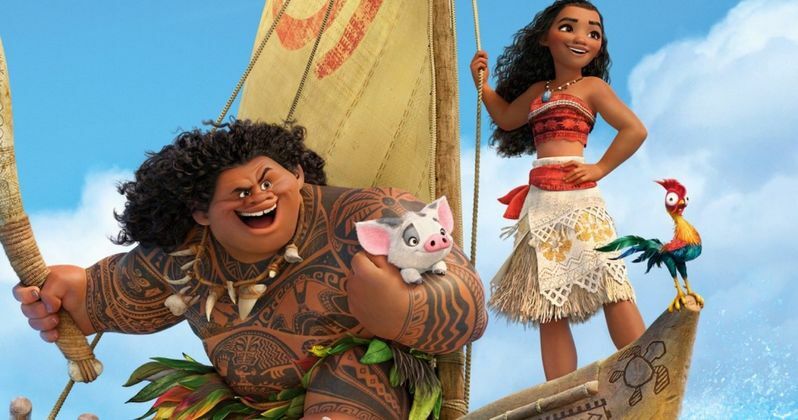 The sing-along version of Moana includes the full feature film with on-screen lyrics, so audiences can belt out the words to their favorite songs, such as the Golden Globe-nominated "How Far I'll Go." Moviegoers can check local listings for showtimes and theaters; the sing-along run will vary by location. Walt Disney Animation Studios' 56th animated feature opened domestically on November 23, 2016, becoming the No. 2 Thanksgiving debut ever with $82 million. The film continues to delight audiences around the globe, earning more than $225 million domestically and $450 million worldwide to date. The film has a 95% score on Rotten Tomatoes and an "A" CinemaScore. Moana has received, thus far, nominations for BAFTA, PGA, Golden Globe and a Critics' Choice Movie Award for best animated feature. The film's uplifting soundtrack has dominated the music charts for more than six weeks, peaking at No. 1 on the iTunes Albums chart; it is currently No. 1 on Billboard's Top Album Sales chart and No. 2 on the Billboard 200 album chart. The soundtrack is available wherever music is sold and at streaming services. At Hollywood's El Capitan Theatre, the Moana sing-along will begin Jan. 20, one week prior to the nationwide opening. Daily showtimes are at 9:30 a.m. and 12:30 p.m. Tickets are available at El Capitan Theatre (6838 Hollywood Blvd. ), by calling 1-800-DISNEY6 (347-6396) or online at www.elcapitantickets.com. Audiences can soon enjoy the original theatrical version of the film at home and packed with a variety of bonus extras when Moana arrives on Digital HD/3D and Disney Movies Anywhere (DMA) on Feb. 21, and on Blu-ray 3D, Blu-ray, Digital SD, DVD and On-Demand on March 7. From Walt Disney Animation Studios comes Moana, a sweeping, CG-animated adventure about a spirited teenager who sails out on a daring mission to prove herself a master wayfinder and fulfill her ancestors' unfinished quest. During her journey, Moana (voice of Auli'i Cravalho) meets the once-mighty demi-god Maui (voice of Dwayne Johnson), and together, they traverse the open ocean on an action-packed voyage, encountering enormous fiery creatures and impossible odds. Directed by the renowned filmmaking team of Ron Clements and John Musker (The Little Mermaid, Aladdin, The Princess and the Frog) and produced by Osnat Shurer (Lifted, One Man Band), Moana set sail in U.S. theaters on Nov. 23, 2016. Take a look at the new Moana poster for the upcoming Sing Along version. Lin-Manuel Miranda to Create First Latina Disney Princess for Moana 2? Can Office Christmas Party Take Down Moana at the Box Office?